I really like the new blog layout. I would have thought Mick Jagger would look better as a femulator, but, um, not so much. Speaking of Jagger, last night Chicago public television showed a film from 1981 when the Rolling Stones attended and then joined a Muddy Waters blues concert on the south side. All of the Stones looked impossibly young (even Keith Richards). I also noted the new layout. I think I like it but it may take a bit of adjustment. 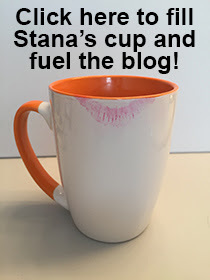 I really like adding your name on the masthead as "Stana's Femulate". Linda, I also recently saw the PBS playing of the Stones with Muddy Waters. It brings to mind a Dylan lyric "Oh but I was so much older then...I'm younger than that now". We were all so much younger back in 1981. Tonight I may get out to a T friendly bar that I have been to on a few occasions. It is Karaoke night. I have never had the courage to sing but speaking of Dylan I may give a run at "Just Like a Woman". Linda and Pat --- Thank you for the kind words about the new layout. Mick has femulated on a number of occasions --- some better than others. If you get a chance, see the HBO documentary on the Stones "Crossfire Hurricane." It includes a few seconds of the Stones getting dressed for their en femme photo that appeared on the sleeve of their "Have You Seen Your Mother, Baby, Standing In The Shadows" 45.